Diep Thanh Kiet, vice chairman of the Vietnam Leather, Footwear, and Handbags Association (Lefaso), said that a 0 per cent tariff rate will be applied to around 50 types of Vietnamese-made footwear products exported to Europe. In this new landscape, Vietnam’s footwear export turnover to Europe is predicted to grow significantly in 2019. Export tariffs for footwear code 6402 footwear with rubber or plastic outer soles and uppers will be slashed to 0 per cent, while half of footwear with leather uppers, code 6403, will enjoy tariff exemptions following the free trade agreement (FTA). The tariffs on other footwear types will gradually be reduced to 0 per cent in the next three to five years. In addition, the EU has offered unilateral preferential treatment to a large number of commodities originating from Vietnam under the Generalised System of Preferences (GSP). “This scheme, coupled with tariff reductions brought by the FTA, will help Vietnamese footwear become more competitive than Chinese products in the EU,” Kiet said. According to Bill Watson, managing director of Coats Vietnam, the EU has established trade agreements with South Korea and Japan. After these agreements were put into place, their exports to the EU increased dramatically. He stated that the EU-Vietnam Free Trade Agreement (EVFTA) will be a major driver for Vietnam’s footwear sector in the next five years. Sportswear, in particular, is predicted to be the biggest mover due to becoming duty-free. In fact, made-in-Vietnam brands have gained European customers’ trust. This, coupled with a low-cost base and improved infrastructure, will make Vietnam an ideal destination for foreign investors. Watson said that more foreign footwear manufactures will relocate their businesses from China to Vietnam to enjoy the advantages of EVFTA. There are over 22 billion pairs of shoes produced in the world every year. Vietnam is the number two shoemaker, following China. By proportion, every 1 per cent migration of footwear from China to Vietnam will help expand the Vietnamese footwear industry by 10 per cent. Most recently, Italy supported Lefaso in setting up a footwear research and development centre in Vietnam by providing machinery, software, and Italian know-how. The Italian Trade Commission has joined hands with the Italian Footwear Manufacturers’ Association to bring an international footwear exhibition in Vietnam. MICAM, scheduled to take place on September 17-20 at the Fiera Milano, is expected to promote collaboration between international footwear producers. Lefaso’s Kiet said that given Italy’s fame for its high-end fashion industry and cutting-edge machinery the country is now home to 5,000 footwear companies and over 600 prestigious manufacturers Vietnamese shoemakers should look to Italian firms in securing firmer footholds in the European market. At a footwear and leather export promotion conference held in Ho Chi Minh City two weeks ago, Phan Chi Dung, director of the Light Industry Department under the Ministry of Industry and Trade (MoIT), said that MoIT is drafting a master plan for the development of Vietnamese footwear to 2020, with a vision to 2025. 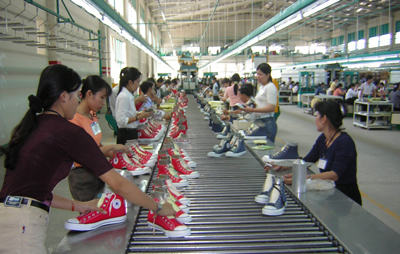 According to the plan, Vietnam will produce two billion pairs of shoes by 2025, doubling the total output of 2016 and reaching an export turnover of $30 billion. The footwear industry has a huge demand for raw and auxiliary materials. If the country’s supporting industries do not develop, the leather and footwear sector will be dependent on imported materials. “Therefore, we encourage enterprises to build factories to produce leather, materials, and accessories in Vietnam. MoIT is considering proposing to the government setting up industrial zones specialised in producing raw materials for Vietnam’s leather and footwear sectors,” Dung said. According to Dung, Vietnamese footwear products are exported to 50 countries and territories, with major markets like the US, the EU, China, and Japan. The production of leather and raw materials in Vietnam has reached a localisation rate of 40-50 per cent. As of 2016, Vietnam’s footwear industry has 1,700 enterprises, including 800 large companies, which altogether employ more than 1.2 million workers. 80 per cent of the larger export enterprises are joint ventures or wholly foreign-owned.